AfroMillions Lotto Jackpot April 2019 | 3 Chances to Win! AfroMillions Lotto has a great promotion, but we suggest you visit Milti Lotto and check what they have to offer. Owned by Oferta365 Limited, it is powered by the Twelve40 gaming platform, innovative company well known for developing games. To cater for players who want to keep pushing their luck on the go, it also offers mobile lottery services. The most exciting thing about AfroMillions lotto jackpot is the amount of money you stand to win. The online lottery space in Africa was in dire need of a fresh contender and it looks like our money spinning dreams can now be brought to life! Most online gambling site offer large progressive jackpots, but none like what the AfroMillions lotto Jackpot brings to the table. From the information at the home page, this is going to be a game-changing introduction to all the lovers of lotteries and instant-win hits. The minimum value for the jackpot from this provider starts from 2.5 million Pounds/Euros or the equivalent local currency (that’s over 1 billion Naira)! Apart from the AfroMillions lotto jackpot, the house also gives out great bonuses to those whose predictions were partially correct but did not get the jackpot. So, you might still win some goodies even if you don’t get hold of the maximum reward. The funds can be used for purchasing lotto tickets, playing Instant Win games or Afro5Live. The biggest difference between AfroMillions and other lotteries in Nigeria and the rest of Africa is their direct support for charity causes. Most lotteries claim to donate money to charities or entities that they choose by themselves. For AfroMillions Lotto charity, the case is different. The company has partnered with Nigeria Professional Football League (NPFL) management allowing you to choose one of the AfroMillions Lotto Football clubs to which part of the profits are donated to. Once the section is officially unveiled, you should expect each of the twenty NPFL sports team covered on the website under the sponsorship section. Just in case football is not your thing there will also be some charities on the site that you can choose from and they will be sponsored by the AfroMillions Lotto charity. So, playing for the AfroMillions Lotto Jackpot doesn’t just give you a chance to become a multi- millionaire overnight, but also allows you to help develop AfroMillions Lotto football clubs or fund verified charities that are doing good to our society. How to Register at AfroMillions Lotto? The registration process is as easy as usual. 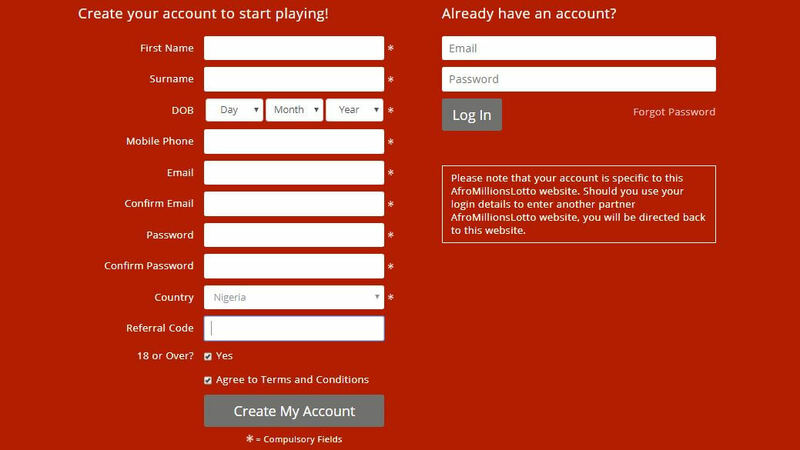 Here is a quick brief of how you can create your account if you are playing for the first time at AfroMillions Lotto. Alternatively, you can sign up using their Facebook page by clicking on the button that says sign up with Facebook. After completing your registration process, next, you will need to deposit funds into your account to buy some lottery or instant win tickets. Just like any other online gambling site, it is best if you read the fine-print in the terms and conditions section. That way you will be 100% sure of every swipe or click you make at the lobby in a bit to rake in some lottery and instant-play rewards. Being an online gambling site, deposit and withdrawal techniques are similar to what you are already used to if you are an avid gamer. Once you have signed up, you need to fund your account to start playing. They will have a minimum of £3.50 or equivalent currency to start with but many more options will be introduced to cater for all types of gamers. Log in to your AfroMillions Lotto account, select the “Add funds” to load your buy-in or select “withdraw funds” to cash out. Input the cash that you would like to load or cash and your billing information. Once the transaction is accepted, funds will hit your AfroMillions account immediately. If you do not know how AfroMillions Lotto works, do not worry as we’ve got you covered. After setting up an account on the AfroMillions Lotto website, you can deposit money using their available payment methods. To take part in the games, pick a line of six numbers ranging from 1-49 and an additional bonus number ranging from 1-9 before buying a ticket costing £0.60 (which is approximately 250 Naira). Enter the numbers into the available boxes provided to officially make your predictions. Alternatively, to simplify the betting, just hit the Lucky Dip button at the site and your numbers are going to be randomly picked for you. You can as well save up to 10 of your numbers on each ticket for reusing later on. To use the same numbers, pick the previous draw and you can use them right away. Once you are happy with your choice, click Buy and you are in the draw. The winning numbers are based on the twice-weekly German National Lottery draw. Once you are done, keep an eye out form the winners of AfroMillions Lotto jackpot and prizes on the website. As Africa’s biggest lottery online jackpot site, this provider offers you a chance to purchase tickets online, check out the latest results or even keep statics on previous lotto results. All these features are currently available to the members so that they can make quick, informed decisions on the kind of games to take on. To stay on top of your game, you should stay sharp and keep coming to this site to check any new bonus codes that may reduce ticket prices for you among other special deals. Subscribe to our newsfeed so that once the lotteries are officially announced, you’ll be among the first players to grab the latest deals. For now, click our buttons to activate some cool offers at the site! Upholding the security of your information is AfroMillions Lotto’s top priority. They follow the strictest standards of security and so, you won’t have second thoughts about the safety of your transactions with them. First and foremost, AfroMillions Lottery is owned and operated by Oferta365 limited, a British based company with plenty of experience in running lotteries all around the world. Furthermore, based on the commendable history of sites powered by the Twelve 40 platform, your safety is 100% guaranteed. All your activities at the site starting from messages to financial transactions are heavily encrypted with the latest cryptography technology. Therefore, the will be no chance of compromise once you start taking on the money spinning jackpot games. If you have any queries regarding your account or AfroMillions Lotto charity or anything else about the site you can always check out their FAQ section on their support website. They offer comprehensive details on everything, particularly questions that are asked most by lottery gamers. In case you cannot find the answer to your question and need further help then you can switch to more support channels like email, live chat and phone lines where you can always reach out to their agents. Apart from turning around people’s lives by through massive jackpots, lotteries have not only greatly contributed to the positive social welfare of the society. We expected nothing less from this new contender in the market. The AfroMillions Lotto Charity has already rolled out its plans to support local football clubs in Nigeria and thanks to their offer of largest payouts in Africa, we expect that lots of lucky souls will soon become instant millionaires with the AfroMillions Lotto Jackpot. If you want to be among the chosen few or you want to make the society a better place through ticket sale donations, register with AfroMillions and start playing the games!